Gold, chemical symbol Au (from the Latin aurummeaning ‘shining dawn’), is a precious metal which has been used since antiquity in the production of jewellery, coinage, sculpture, vessels and as a decoration for buildings, monuments and statues. Gold does not corrode and so it became a symbol of immortality and power in many ancient cultures. Its rarity and aesthetic qualities made it an ideal material for ruling classes to demonstrate their power and position. First found at surface level near rivers in Asia Minor such as the Pactolus in Lydia, gold was also mined underground from 2000 BCE by the Egyptians and later by the Romans in Africa, Portugal and Spain. There is also evidence that the Romans smelted gold particles from ores such as iron pyrites. Easily worked and mixed with other metals such as silver and copper to increase its strength and change its colour, gold was used for a wide range of purposes. In most ancient cultures gold was popular in jewellery and art because of its value, aesthetic qualities, ductility and malleability. Electrum (the natural alloy of gold and silver) was used in jewellery by the Egyptians from 5000 BCE. Gold jewellery was worn by both men and women in the Sumer civilization around 3000 BCE and gold chains were first produced in the city of Ur in 2500 BCE. The Minoan civilization on Crete in the early 2nd millennium BCE is credited with producing the first cable chain jewellery and the Minoans made a vast array of jewellery items using an extensive range of techniques. Gold jewellery took the form of necklaces, bracelets, earrings, rings, diadems, pendants, pins and brooches. Techniques and shapes included filigree (a technique known to the Egyptians from 2500 BCE) where the gold is pulled into wire and twisted into different designs), beaten thin shapes, granulation (surface decoration with small, soldered granules of gold), embossing, chasing, inlaying, moulding and engraving. In South America, gold was similarly worked by the Chavin civilization of Peru around 1200 BCE and gold casting was perfected by the Nazca society from 500 BCE. The Romans used gold as a setting for precious and semi-precious gemstones, a fashion continued into the Byzantine era with the use of pearls, gems and enamels. THE VALUE AND BEAUTY OF GOLD MADE IT AN IDEAL MATERIAL FOR PARTICULARLY IMPORTANT POLITICAL AND RELIGIOUS OBJECTS. Gold was first used as coinage in the late 8th century BCE in Asia Minor. Irregular in shape and often with only one side stamped, the coins were usually made of electrum. The first pure gold coins with stamped images are credited to king Croesus of Lydia, 561-546 BCE and a contemporary gold refinery has been excavated at the capital, Sardis. Even the purest naturally occurring gold can contain 5% silver but the Lydians were able to refine their gold using salt and furnace temperatures of between 600 and 800°C. The salt mixed with the silver and formed a vapour of silver chloride leaving behind pure gold which could be used to create a standardised coinage of guaranteed gold content. 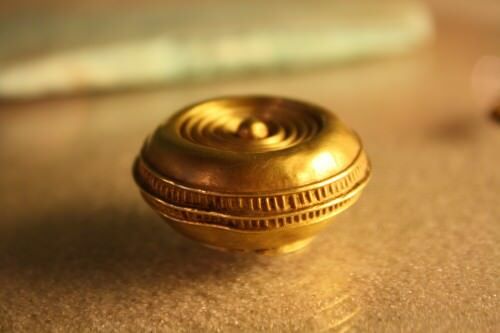 The Mycenaean civilization also widely used gold coins, as did the later Greek and Roman Empires, although silver was the more usual material used. 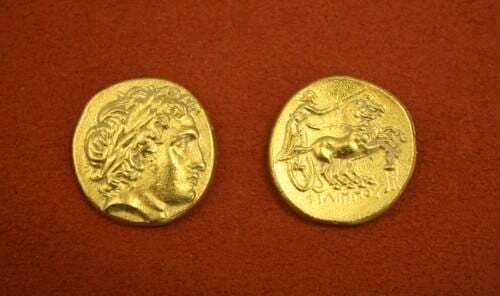 One of the most famous gold coins in antiquity was the Roman bezant. First introduced in the reign of Emperor Constantine it weighed up to 70 Troy grains and was in currency from the 4th to the 12th centuries CE. The value and beauty of solid gold made it an ideal material for particularly important political and religious objects such as crowns, sceptres, symbolic statues, libation vessels and votive offerings. Gold items were sometimes buried with the dead as a symbol of the deceased’s status and the conspicuous (and non-profitable) consumption of such a rare and valuable material must surely have been designed to impress. Perhaps the most famous example is the so-called mask of Agamemnon found at Mycenae. 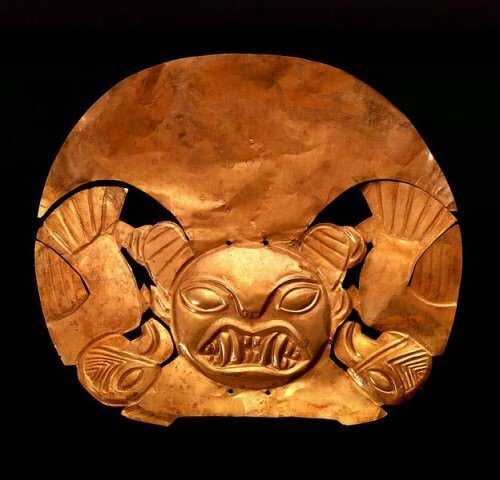 In the Inca civilizationof Peru gold was considered the sweat of the sun god Inti and so was used to manufacture all manner of objects of religious significance, especially masks and sun disks. In ancient Colombia gold was similarly revered for its lustre and association with the sun and in powdered form was used to cover the body of the future king in a lavish coronation ceremony which gave rise to the legend of El Dorado. As a decorative covering, gold plate and gold leaf (gold beaten into extremely thin sheets) have been used to decorate shrines, temples, tombs, sarcophagi, statues, ornamental weapons and armour, ceramics, glassware and jewellery since Egyptian times. Perhaps the most famous example of gold leaf from antiquity is the death mask of King Tutankhamun. Concerns over the authenticity of gold led the Egyptians to devise a method to determine the purity of gold around 1500 BCE (or earlier). This method is called fire assaying and involves taking a small sample of the material under test and firing it in a small crucible with a quantity of lead. The crucible was made of bone ash and absorbed the lead and any other base metals during the firing process leaving only gold and silver. The silver was removed using nitric acid and the remaining pure gold was weighed and compared to the weight before firing. Archimedes was also aware that the specific gravity of gold is altered depending on the percentage content of base metals, pure gold having twice the gravity of silver for example. Gold is such a precious material that for centuries various attempts were made to produce it through alchemy – that is the chemical transformation of base metals into gold using the philosopher’s stone (lapis philosophorum). First attempts were made in China in the 4th century BCE and also in ancient Greece and although unsuccessful, nevertheless, the activity laid the foundations of modern chemistry.